I got an email this morning about the release of the new line by MAC called Heavenly Creature, online today but in stores on 7/5. 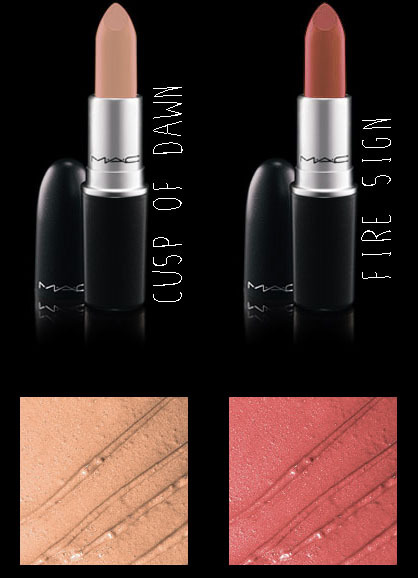 Usually I am not very hyped up on MACs limited edition lines because the packaging is usually god awful. But this line has the original classic MAC packaging, and the products are GORGEOUS. As always I am really draw to the lipsticks, the blushes where tempting, but I want to see swatches of them before I commit. I made two lipstick purchases, I bought Cusp Of Dawn and Fire Sign, I am usually pretty happy with the lipsticks so I am fine with buying them blind. hey Andrea I'm your follower now:) please become one of my follower back. Hey, thank you for visiting by blog, just followed, follow back? Great post, love! I have a rubywood Mac, it's my favorite! regard following is absolutely perfect for me. gladly following u and wait u anytime!